I love stories. I love the stories that feel good, the stories that sustain and strengthen us, the stories that stay with us for a lifetime. When we were kids, it was our mother’s Super Hero Story that was our favorite. “Tell us again, Mommy!” we’d plea. And our mother, she’d always oblige. Every time, it began the same way, on that healing journey from Massachusetts all the way to Colorado after her first husband, Dexter, had dropped dead at the kitchen table of a heart attack. It was her parents, our Grandma and Grandpa, who had packed them up, our mother and her kids (my big brother and sister), and drove them west in the 1952 Chrysler Imperial. It doesn’t matter that now, fifty years later, I adore spiders, that a year ago, my husband, Cam and I saved a tarantula from almost certain death at the hands of a Puerto Rican groundskeeper, nudged it off the resort’s patio back into the thicket of jasmine. It doesn’t matter that earlier on that same trip, Peter, a guide of ours as we hiked through the rainforest, had shared how awesome tarantulas are, how they eat harmful bugs and will not hurt us. It doesn’t matter because our long-legged mother had just lost her husband and I suspect was lost herself in that sweltering Kansas heat, and that night in a hotel in the middle of a cornfield in a world that was foreign to her, she had found something, something strong inside, and she had called upon it, and we, her children, cheered her on, again and again and again. It is safe to feel this alive!!! It was the darkest time of the year, in the early morning before the winter sun rose above the Berkshires, and, as I lay there, my bones heavy, my muscles relaxed, I could hear his words soak in deeply. “It is safe to feel this alive!” And, those years ago, in a sanctuary room at Kripalu Institute, a week into this session of the yoga-teacher- training, I knew that Yoganand’s statement was true: it was safe to feel this alive. Here I was, at the end of a pre-dawn session of yoga in a darkened room, sprawled out in stillness and I couldn’t have felt more vibrant. It was as though every cell in my body, and there are trillions of them, was lit up, plugged in, jumping up and down, dancing, even, with rock and roll-filled head-banging vigor. It was exhilarating. Rejuvenating. And I wasn’t DOING a thing. I was simply lying there, experiencing an inner concert extra-ordinaire. And in that moment, I did feel safe, safe to relax and allow this not-so-little light of mine to shine. It is safe to feel this alive! And thank goodness for the practices that keep our body containers confident and strong enough to hold this waterfall-whoosh of unbridled life, that keep our psyches sane and relaxed, so we really can allow this energy to flow. I had been practicing yoga several hours a day for almost a week of yoga “boot-camp”, before my cells, the trillions of them, picked up their electric guitars and starting jamming. Earlier in the training, before really settling in, it was the calmness of a symphony or an Indian chant that my body was ready for, that my psyche preferred. I have a picture of myself that I have enlarged into a poster, almost to life-sized proportions. 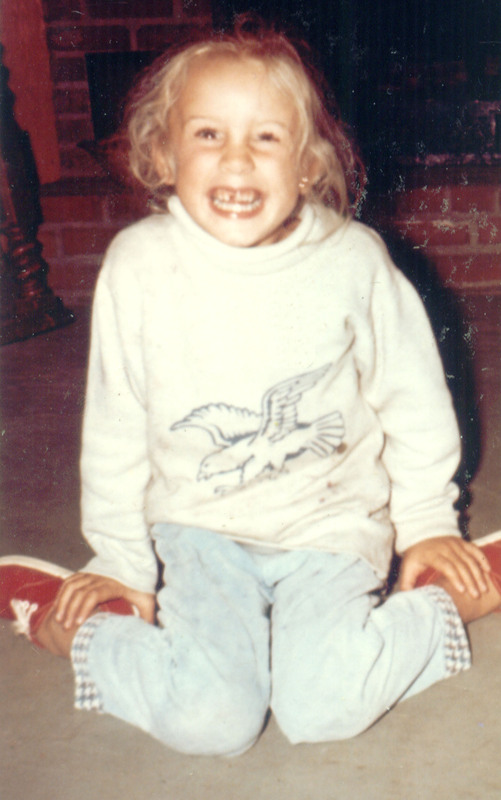 I am four years old in this photo and it is summertime and I am sitting in front of the fireplace at our cottage. And I’ve printed the words, “I’m not too much for me!! !” across the sweat-shirted front of this younger version of Helen. And, as I look at her, at her over-the-top, tooth-missing-early-because-of-her-wild-ways grin, and her body-electric, plugged in, I can’t help but laugh. I don’t think, at this moment, she was too much for herself. I don’t think at this moment, I was too much for myself. As a little girl, I loved summer. I loved the pool of sun on our cottage porch where I’d sit in the mornings with my cat, Snoozles. I loved the sparkle on the cove at mid-day, the way I held on tightly to the ropes of my swing and pumped hard with my strong skinny legs, high up over the hedge and the clothesline to see that sparkle. I loved the way I scampered without shoes across the rocks and felt the prickle of barnacles on my bare feet. I loved the way I played for hours on our beach and splashed in its waters at high tide. My body-container grew strong during the summers of my girlhood and the ants in my pants found a way to wiggle with freedom and glee and I believe that I knew, in those summer months, that it was safe to feel this alive. And, so what, if over the years, there also have been times, many times, when I’ve pinched off this life force, stuffed myself into a box that was too small, or felt myself ungrounded, prickly and static-clingy, energy flying this way and that with no focus or melody at all? So what?!? We are ever-expanding beings, growing and growing and growing. And it’s a forward-focused growing game we’re playing and I’m learning more and more that I can plug myself in, say, “Bring it on, Universe! Bring on the feel-great envisioning, the next dream, the next opportunity to play! I’m not too much for me!! !” I think of the lobsters who live on the bottom of that cove that was the summer playground of my girlhood, how they, too, are ever-expanding beings, how, each summer, they shed their shells, then grow new ones that are a little bigger, new ones that they need to grow into. And, I don’t think they struggle with this growth. I don’t think they panic. I don’t think they say, “I just can’t grow any bigger. I don’t think I can take the next step, do the next thing, manifest the next dream.” I suspect they relax, allow themselves to grow into how big they’ve become. And I know that we can do the same. When we plug ourselves in – in all the ways we plug ourselves in – on those long walk in autumn leaves, on the ski trails of winter, in the kitchens, in the bedrooms of our homes, while patting our cats or dogs, while hugging a baby or an elderly parent, when we plug ourselves and feel ourselves safe and secure and strong in these body homes, we, too, can relax; we, too, can feel the thrill of our bigness, of our mighty ever-growing song, the one that only we can sing. We, too, can say, “It is safe to feel this alive!” And how fun is that?!? Okay I’m not in Paris. I’m not in the City of Lights soaking in the light of late autumn. I’m not eating warm-roasted chestnuts as I wander the streets of the Marias, not moseying into the shops in the Saint-Germain neighborhood where my grandfather once lived, not viewing the city from the Eiffel Tower or the top of the Ferris Wheel or the banks of the Seine. And I’m not finding my way home again to the already-reserved Hotel Tremoille which I understand is located on a quiet street a stone’s throw from the Golden Triangle and the Champs-Elysees. I’m not in Paris where I planned to be, where I dreamed I’d be, where my intuition seemed to be leading me. It had seemed crystal clear, this inner guidance guiding me to the light of the City of Lights. Little did I know that it was the earth’s clear crystal that I was really seeking and the clarity that emerges in the light of a wide-open landscape. And have fun, I did! I found my way down the Back O’ Beyond Road, parked the rental car, and placed one happy foot in front of the other, on a slick-rock trail pointing skyward to Cathedral Rock. My mind might have thought that what I wanted was city shoes, the light of Paris, the creative thrum at its heart, but my spirit knew that I was thirsting for something different. As I climbed straight up, sometimes clinging to handholds and footsteps, sometimes finding a more level spot where I could turn and marvel at the magnificent vistas of red rock canyons, I knew that I was in the right place. My body kept saying “I’m happy! I’m happy!” and my inner athlete grew hiking wings and I felt young again, enlivened. I smiled at fellow hikers. We encouraged each other on. I was on a pilgrimage to the top to my own version of Notre Dame. And, at the top of the Cathedral at a vortex site on a ridge jutting out into the sky, I leaned back against that red rock, with a crystal clear wind blowing through me, and, in that moment, I knew that I, indeed, was in the vortex. And now, hours later, after another hike through craggly junipers, pinyon pines and the flaming red rocks at sunset, I find myself back in my motel with a full moon hanging outside my window. And I’m ready to crawl into bed, ready to pick up the remote and push that magic button that rents a movie. And guess where I’m going, for the second night in a row? I’m going to Paris! I’m going to glorious, infamous Paris, the city of light, the city of delights, the city I dreamed about. I’m renting Woody Allen’s Midnight in Paris again and I’m spending midnight in Paris, just like I did last night, with main character and fellow writer, Gil, and the writers and artists that he meets from the 1920’s when he slips back in time. I, who find myself in the southwest of the United States, am dreaming up Paris! Allow laughter to lead the way . . .
And that’s when the party revved itself into high gear. We started reflecting back to trips we’d already taken. And it wasn’t the awesome that rang our chimes; it was the awful. There’s nothing like traveling-nightmare-stories to lift a traveling group’s spirits. The woman who was flying to Missouri for her aunt’s funeral said that, some years back, she was given the opportunity to be part of a delegation to the Holy Land when she was four months pregnant, to all the sacred sites, places deemed unsafe today. And, to her horror, the morning sickness that had subsided after Month Number Three lifted its ugly head, and she, in Month Number Four, lowered hers, in every sacred site along the Holy Land Trail. “I threw up in Bethlehem, in Nazareth, and all over the city of Jerusalem.” “Ohhhh . . .”, we, who were standing and sitting around her, commiserated. “Ohhhh . . .”, we, who were standing and sitting around her, laughed. And that brought on a string of Jet Lag Tales and the pitch grew even more fevered. I shared how, on my first trip to Europe, before I knew the power of jet lag, I fell asleep sitting up on the open top floor of one of those wonderful double-decker buses in London, while my future-daughter-in-law whose jet lag hadn’t hit her yet, gleefully snapped shots of me, mouth open, drool dripping down my chin, Old Ben, the Tower of London, Buckingham Palace whizzing by. It was then, in the jazzed-up midst of our Jet-lag stories, that someone noticed that one of our party members was standing there with the fly on her corduroy pants gaping wide open. By now, our bond was strong and our laughter even stronger. As the woman zipped up her fly, one man, in a business suit offered his two cents. “Please, ladies, tell me if my fly is unzipped. Even if you feel uncomfortable, even if it is a stranger . . . a man wants to know.” I took his advice to heart. I took it all to heart. How could this be so fun?!? How could this be so funny?!? Many of us had weathered the cancellations that yesterday’s blizzard had brought on, and, most of us, had managed, with a measure of grace during the first mechanical problem this evening that had forced us into a flurry of re-booking on later flights. But this, this was too much. We finally had been ushered out onto the plane. We had buckled ourselves in, turned our cell-phones off, set our noses in the direction of our destinations. So what was the hold-up this time?!? Why were we being herded back down the jet-bridge into the crowded holding tank?!? It couldn’t be! It was just too absurd! But it was true. Someone had sat on the exit row arm- rest, and had broken it – snapped it right off! So here we were, world travelers, traveling the world with our laughter and stories and we hadn’t even left the ground. Here I was, laughing right along with the crowd, an instigator even, prodding the stories on, the ones that left our metaphoric flies unzipped. Here I was, still in my home-port, with a growing hunch that this wasn’t going to be the weekend that I made it to that destination I’d been dreaming of for the past two months. Here I was, travel plans thwarted because of a broken arm-rest, shifting gears, knowing that I was in the midst of a good story, one with twists and turns and new dreams brewing, one where I didn’t know the ending or even the middle yet, one that sure was going to be fun to share. “It’s stolen time!” That’s what my Joy Center friend, Matt, told me last evening as we talked on the phone. “I love stolen time!” he said. He went on to explain that stolen time becomes our gift to spend anyway we want when we are transported out of our scheduled agendas, our day-to-day routines. So that’s what I’m living right now, twenty-four hours of stolen time. My plans for this weekend began to take shape back in early September. I knew autumn was a time that my husband, Cam, would be off on his own adventures. He’s an avid bow hunter and was planning two extended trips out west with his guy friends. I love that he’s living his dreams these days, claiming the time to do what he is drawn to, and I wanted the same for myself. I sensed that I needed my own adventure, an adventure that stretched my boundaries, that felt like an edge, a fun edge. And I sensed that I wanted to put into practice this dream of mine to dance the globe being the storytelling traveler. I think I also knew that my gypsy feet were antsy, that, as much as I love Joy Center and all that it is becoming, I’m finding myself feeling tethered to my own rigorous expectations and routines on the homefront. And so, on the morning of the autumnal equinox, the day after my performance, “More Please!! !,” I trusted my vibes and went for the “more please”. I called Delta and made my plane reservations – for a weekend trip, leaving in the early evening on a Wednesday, and coming back late on a Sunday night. I had it all planned out, and things were moving along smoothly, down to the very last detail – until the blizzard blew in and stopped me in my tracks. Yesterday afternoon, as I was opening the front door with suitcase in hand, I received the phone call from Delta. My flight had been cancelled. And the computer voice on the other end of the phone went on to say that I had been re-scheduled for the early morning flight on Friday. I closed the front door and hung up the phone, stunned. That wouldn’t do. It simply didn’t leave me enough time for my adventure. And I knew that this was an important one, as important as my week-long trapeze escapade four years ago where I got in touch with an inner strength that I didn’t know was there for me, as important as the weekend improv workshop with Alan Arkin where, after a day and a half of fearful struggle, I let myself be me, ridiculously, gloriously, fully me, even in front of all those seasoned actors. Even though the reasons were not clear to me, and still are not clear to me, I knew yesterday that I was meant to fly off on this adventure, on this particular weekend. So there I stood with my coat still on, not knowing what to do. And that’s when my friend, Garee, called. She was calling to warn me that the roads were in bad shape, to take extra time driving to the airport. I told her that there was no need for the caution; I already knew about the roads and I was in as bad shape as they were. And I was. For a good fifteen minutes, I felt stuck without options. A foot of heavy slushy snow had dumped down on our county and the wind was blowing hard and there was no place to go to escape the weather or to escape the way I felt. And that’s when I realized that the snowbound predicament I was finding myself in was a magnifying glass for some areas in my life where I’m feeling stuck. And that’s when the light bulb went off in my head and I realized that I was the one who could change the scenario. I wasn’t really stuck, only feeling stuck. So, I took action, called the Delta hotline, found out that there was a place on the early evening plane for today, Thursday. Then I called the airport and the nice man told me that his best bet was that the storm was blowing through and the plane would take off. And I felt a little less stuck. I had a new plan, a new reservation, and a destination that was still calling to me. And I watched my feelings change. I began to sense that this time at home was going to bring me gifts, as magical as the gifts on my fly-away adventure. I began to sense that this time at home was, indeed, a part of my adventure. As late afternoon turned into evening, the howling wind didn’t sound so ominous. Instead it became a song, beckoning me inward. Cam was gone on his hunting trip, the cat was sleeping on our bed, and I could do whatever I pleased. Nothing scheduled at Joy Center. Nothing scheduled anywhere. Even before Matt’s phone call, I was loving the gift of stolen time. I puttered in the kitchen. I painted my toenails red. I crawled into bed and journaled. I climbed back out of bed and pulled on my snowpants. I trudged around the block breathing in the winter-like air and admiring the snow-laden branches and neighborhood snowpeople. I allowed the evening to be free and spacious, and marveled that we humans have the power to shift our emotions, and that it doesn’t take all that long to move from a place of despair and stuckness to a new place of hopefulness and expectancy – and that this shift can take place wherever we find ourselves, even snowbound at home when we thought we’d be flying high in the air. And so, my bag is still packed. My computer ready to be added – perhaps there will be a blog from my destination! I’m feeling less rushed, more ready. And I’m opening to the feel-great possibilities that will arise during this weekend, to the feel-great possibilities that will arise when I return. What is is that you really do want, Helen? I am thinking about food, the way that my food journey is a road map for how to navigate my life journey. What is it that I really do want? Life is a huge buffet of choices, an infinite smorgasbord of perspectives and ideas and opportunities. And this question, that I ask myself over and over, keeps me grounded in what “tastes” good in the present moment. It helps me trust my own gut. When it comes to food, I am good at trusting my gut. I really am. I love to eat. My father used to boast that his skinny nine year old daughter ate more than he did. And I was brought up in a family that loved food. Cooking was not a chore for our mother – it was a pleasure, a creative outlet, a playground of possibilities. In the summer, our mother gardened and had a compost where we learned that our rotting leftovers became rich dark soil. We were raised on chard and kale and spinach, on carrots we pulled from the ground, and mackerel and flounder we caught in the cove. And there were deserts, too, blueberry cake and date-filled cookies and rhubarb pudding from our own red stalks. In our family, we had sweet tooths and sour tooths and bitter tooths and salty tooths. We kids pulled sticky spruce gum right off the trees and chewed it as if it were the most expensive store bought flavor, and our mother picked dandelion greens from our cottage lawn, sautéed them in mustard and sourcream and sweet white onions. 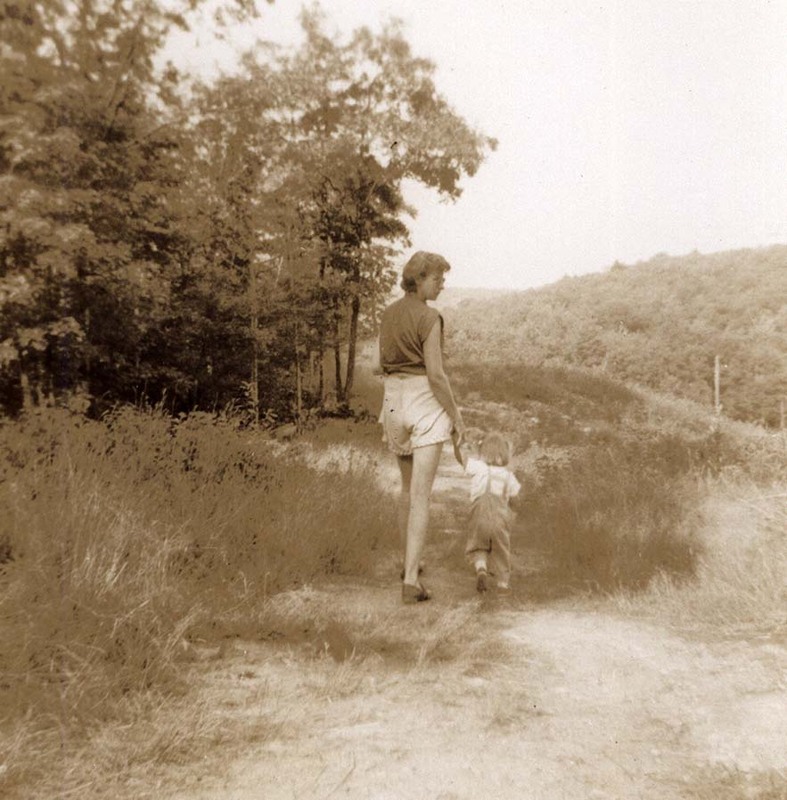 We were given choices, carried right along on our mother’s own food journey. When our mother leapt onto the eating-for-a-healthy-planet bandwagon, we followed, and hearty grains, and crispy stir-fries were added to our menus. And when I was a teenager, she brought the whole world to our kitchen table in coastal Maine as she cooked exotic meal after meal from the Time/Life International Series. So I was raised with a world of eating possibilities, and a healthy happy outlook toward food. Although I love to peruse cookbooks and watch cooking shows, I have not spent a great deal of time studying the nutritional value of one food over another. And I don’t know the ins and outs of the various diets. When it comes to food, I learned, early on, to trust my own gut. While still in grade school, I noticed the difference, how I felt when I ate something that didn’t agree with me. It didn’t feel good to my gut to eat doughnuts dripping in maple syrup for the main course of a Friday night dinner at my best friend’s house, even though they were homemade that very day. And brussel sprouts were just too bitter for my child palate, even though everyone else seemed to like them. I’m appreciative of this inner radar that was fostered in my childhood. I have always known that food is here for our pleasure, and the gathering and the preparation of it can be filled with fun. I love to shop at the local food co-op and the Saturday morning farmer’s market. Not only do I draw into my bag the foods that are calling to me, but I visit with friends, feel a part of something big and friendly and local. I love to listen to what I’m hungry for, beans and rice one day, a huge salad, a plate of sautéed greens, grilled portabellas the next. I love to eat pasta when its calling to me, the kind made in Italy that I buy from the local wine store, pasta that tastes almost as good as the pasta we savored in Sicily last May. I love strawberries in late June and raspberries off our bushes in July, peaches in August, and the first crisp apples of late summer. I love to juice with my new juicer when fresh juice is calling to me and to mix up smoothies when its their voice I hear saying, “I’m what feels good today.” I love to listen to what I’m hungry for, and to honor it, even if it seems weird to the rest of the world. I’m brave when it comes to my food journey. I don’t compromise often on my integrity. It is indeed a journey I take from the inside out. And I want to bring this level of bravery and clarity to my life journey, to the moments where the outside voices, or the inside old beliefs are keeping me from hearing my own gut’s calling. The beauty is that our guts are always there for us, and they are always hungry, and they never lie about what we really want. And all of us are capable of quieting down enough to listen. And I know that when I trust my gut, and I’m doing this more and more, the moments taste delicious, and each day becomes an amazing meal to savor.